To ensure you own a diamond ring that is faithful to your heart’s desire with personalised elements, Chow Sang Sang sincerely offers you our personalized jewellery service. You can select your preferred diamond size, quality and ring setting, expressing your unique love story. A design will be sent to you for preview before placing order. The customisation process is simple and efficient. For details, please see Personalisation Process. Select your favourite diamond based on diamond brand, colour, clarity, carat, cut, fluorescence, diamond grading certificate and price. Each diamond has a certificate of international gemological laboratory; please click the link to learn about details of the certificate. 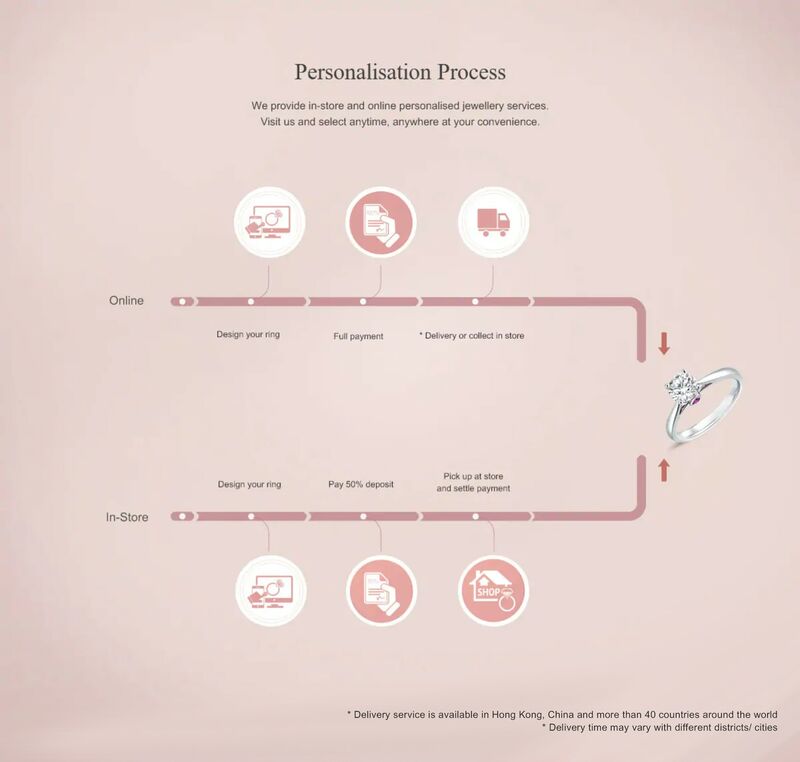 Select your favourite ring setting based on ring deisgn, metal, ring brand and price. 3. In your “Wish List”, mix and match your previously selected diamonds and ring settings and preview the design. 4. You can add the chosen design to your shopping cart and proceed to payment. Personalised diamond rings are not eligible for return or exchange service. To keep your jewellery piece as immaculate as when you first laid eyes on it, we recommend regular inspection and cleaning. These services are available at all of our stores, regardless of which Chow Sang Sang store you made the purchase from, including our eShop. There, your item will be carefully evaluated by our Sales Associates or Customer Service Team before any after-sales service is carried out. We will determine the best method, either through soft brushes or ultrasonic cleaners, to bring the brilliance back to your piece. Subject to individual styles, we can enlarge or reduce the size of rings at your request. Removing superficial scratches or dullness, we will delicately restore the lustre of your piece. Subject to the condition of your piece, we will skillfully restore its original appearance or functionality. Services include assembling broken parts as well as reshaping and resetting stones. For more after-sales services, please browse “Customer Services”. No, but it is extremely easy to create an account. Simply click “Register” and follow the registration process. 2. How to select the size that fits me? Please check the “Ring Size Guide” for ring measurement. 3. Can I enjoy the privileges of Chow Sang Sang Star Shopper upon my purchase of personalised diamond ring? 4. After placing order, can I make changes if I find the diamond or ring setting not suitable? Once order is placed, no changes can be made with personalised diamond ring. 5. After I receive the diamond ring, can it be resized if I find the ring size does not fit? Resizing can be made for certain styles, but with limitations. For details, please consult our Sales Associates or Customer Service Team.